Ask the Readers: Should I Move My Toddler Out of His Crib? My son, Haiden, will be turning three in July. I'm knocking on wood right now, because he's never, ever attempted to climb or jump out of his crib. In fact, I'm pretty sure his crib is his “happy place.” He like to play in his crib and sometimes even asks to go in there if he's feeling sad! I keep getting the vibe from a few people that Haiden should be moved into a “real” bed, but I'm not feeling like either one of us is ready for that yet! It seems like most parents I know move their kids into a toddler bed right around the time they turned two. I even know one mom from my hometown who moved her son into the bottom bunk of a full-size bunkbed within days of his second birthday! I'm feeling pretty conflicted right now. First, I'm wondering: Is there anything wrong with keeping a child in a crib indefinitely? Will my husband and I just know when it's time to move him into a bed? Also, what kind of bed should he use once he's out of the crib? Do you recommend a toddler bed, or did your little one jump right into a twin bed (or bigger)? I'd love some advice from experienced parents on this topic! Please leave a comment below with your ideas and suggestions. Don’t listen to other people! I made the mistake of listening to my sister-in-law when my daughter was 2 and she said that she shouldn’t be in a crib any longer. I knew in my gut that my daughter wasn’t ready, but I listened. My daughter loved her crib. She went to sleep by herself at bedtime and she was fine. Once she got into her toddler bed she wanted out, she wanted someone to stay with her and now at 4 1/2 years old she’s finally getting to the point where she can sleep by herself in her own room again. What is good for other people’s kids may not be the same for yours. If you’re feeling that he should stay in a crib then let him be. I have a 2 1/2 year old who is in a twin bed. Right before her 2nd birthday we were visiting family and she wouldn’t go to sleep in the pack and play and would only go down on the air mattress my husband and I were sleeping on. When we got home she wanted nothing to do with her crib and wanted to sleep on the twin guest bed that is also in her room. I was pregnant then (and still am now- I’m due in a few weeks) so we knew we were going to need that crib. So we just let the choice be hers. The twin is VERY low to the ground (about a foot) and she’s never fallen out or had any trouble. For us it was an easy decision. We needed the crib and she wanted to sleep in a bed. If you’re child still has plenty of room and isn’t trying to climb out, I can’t see why it would be a bad thing. My girl had to have a crib tent from about 10 months becasue she used to try and climb out, so her being in a bed has actually made things easier. We moved my twin girls to toddler beds just shy of their 2nd birthday. I have regretted it every day since. It was done out of necessity for us (my brother and SIL really needed the cribs for their new twins). We have a new little one that is one year old and I will be keeping her in her crib for as long as I possibly can, whether that means we have to buy a crib tent to keep her in or not. I think you are fine leaving him in his crib for as long as he will tolerate (and enjoy) it. If he starts to climb out, maybe then you can think about converting it to a toddler bed or moving him to another bed. I wouldn’t worry too much about it now. He seems happy and you are happy. It doesn’t matter what anyone else thinks. Keep in mind that toddler bed mattresses (same size as crib mattress) will fit them until they are about 5 years old. My girls are 4 now and still have plenty of growing room in their beds, so he should still have plenty of room in his crib if he wants to stay there for awhile longer. As long as he’s not trying to get out and still fits comfortably in there, I’d let him stay. Oh I forgot to add my first son went from his crib to converted crib into toddler bed for a few months, then to a full size bed. My second son went straight from his crib to a twin sized bottom bunk. Anything will work, but if it’s too high off the ground, you may want to get a bedside rail so they don’t fall out. I am also in a similar situation. We have a 21 month old and are expecting a baby just one month after his 2nd birthday. I have also struggled with moving him into a bed because he has not attempted to get out of his crib either. I read a lot and decided the best thing for him would be to leave him in his crib until HE is ready to be moved. As long as your child is happy and safe in the crib I say let them stay in it. I’m not sure if there is a weight limit on your crib buy maybe consider that. My son is a peanut and weighs about 23-24 pounds at 21 months, so I’m not concerned with a weight limit. Good luck and just remember you are the parent and knows what is best for your child. Don’t be concerned with what is “right or wrong” according to other parents. We moved my son out of his crib last summer, when he was almost 3. Like your son, he’d never climbed out, and really seemed to enjoy having a cozy, safe spot for himself. I felt conflicted, too, about the move, and gave into some pressure from my DH about him sleeping in a big boy bed. My advice is this: follow your son’s cues. If he expresses interest in making the bed move, then go for it. But if he’s happy and doing well and sleeping safely, why mess with success? There is so much pressure from others to do things on a certain schedule, and if I’m learning anything as a mama, it’s to follow my own instinct and those of my children. Our son, who will also be three this summer, has been in a bed since he turned two. Around that time we ended up moving in with my in-laws for awhile and so put the crib in storage to free up space. He did really well in the bed but he had never really loved his crib so it was a good change for him. We went with the Ikea adjustable bed(http://www.ikea.com/us/en/catalog/products/S39847516), which I LOVE. It is low to the ground and wider so we didn’t put a bed rail up (and our son has never fallen out) but we can extend it when he starts to grow. Whatever you decide I don’t see a problem with leaving him in his crib as long as he is happy! I recently moved my 2 1/2 yr old into a toddler bed and I had a hard time doing it. She loved her crib and slept very very well in it. Although she was the one that kept asking if she could sleep in her toddler bed (which my parents bought her for her 2nd birthday but we weren’t ready to move her into it), I wasn’t so sure that I was ready to completely give up the crib. We’ve now moved the crib out of her room and she’s sleeping “ok” in the bed but I find her crawling out of it and making her way into our room pretty often…. and that’s exactly what I was afraid of. I fee like we’re having to “re-train” her to sleep in her own bed in her own room and I know we’ll get there eventually, but for now bedtime routines are taking twice as long because she won’t stay in bed. I wish we would’ve waited a little longer but at this point, I refuse to re-assemble the crib and haul back into her room. My son however, was in a full size bed at age 2 and he did extremely well. He’s now 6 and I’m really glad we went for the full size bed. He has a little brother so when he outgrew his crib he went straight into the full size bed with his big brother (luckily they were both very excited about sharing a room!). we converted my son’s crib when he was 1.5 yrs old. My husband was leaving for 6 months so we did it early. I was just tired of picking him up to put him in and out of the crib. And if he was asleep I couldn’t grab him nor place him in it. So it was the best choice for us. Once we moved (2.5 yrs old) we put his bed in the soon to be new baby’s room as a crib again and just went big and bought him a full bed. He loves his big bed and daddy can have a slumber party with him on saturday’s to make him feel special since he works so much. He has a little step so he can get in and out of the bed on his own since it is a platform bed and we got the mattress with a pillow top. My son turned two in March and we just converted his crib to a toddler bed this weekend. It wasn’t out of necessity or anything, I just felt he was ready. He has done incredibly well and I think it’s great that he is learning to be independent. It was getting annoying to go get him out of his crib after he screamed at us. Now, he just gets up when he is ready and joins us. It hasn’t affected his sleep pattern at all and he loves his big boy bed. I think the crib conversion is a great way to go because they have the same bedding, mattress, etc. and it “feels” comfortable and what they are used to. It’s kind of a baby step before throwing them into a big twin bed that is totally new. My gal turns 3 in October and she’s still in her crib. She’s never tried to climb out, and I’m happy to keep her there for as long as possible. I’m not ready — emotionally & environmentally — to have her potentially roaming her room or our condo at night/early morning. When it comes time, we’ll convert her crib to a toddler bed. I also think that you should do what you think is best–if everyone is happy with him still being in his crib, then why rock the boat? 🙂 Personally, we went from crib to toddler bed, when my son was 2 (only b/c we were moving, and I didn’t want to mess with taking apart the crib and putting it back together again–otherwise he would have stayed in the crib longer). He just now turned 3, and we have already put him in a twin bed with mesh rails on both sides. They outgrow toddler beds so quickly, if I had to do it over again, I would have gone straight to the twin. When I was three, my parents still had me in a crib – until the day I tried to get something off the wall, fell out, and broke my arm. True story from 32 years ago. I just moved my son, Ryan, 19 months, into a toddler bed. I was also very conflicted about it. We are expecting twins in August and I need the crib fro them. Since they will be sleeping in my room for the first several months, I was going to just leave Ryan in his crib. It is also his happy place. But it was getting hard for me to lift and lower him into it, and I didn’t want him to associate them with stealing his crib. He loved the toddler bed but got upset when my husband disassembled the crib and took it out if his room. He cried some the first couple of times he slept in it but he is actually doing really well with it now. I do think he will stay in that bed for a long time because i think that a twin bed would be too much for him and he would probably get overwhelmed. Is your toddler too big for a toddler bed? If you gave one or could find a cheap one it may help him adjust better before gong to a twin bed. Don’t do it! It doesn’t sound like he’s ready. There’s no stigma to sleeping in a crib. I have a friend whose daughter slept in a crib til she was 4. So what? It’s not like using a pacifier which can cause damage to your mouth/bite. I moved my son out of his crib because he kept climbing out. I wish I would have just gotten a crib tent. Bedtime and naptime were so much easier when he was in his crib. Don’t let people pressure you. If things are fine the way they are, why change? I just wanted to say thanks for posting this question. We’re not to this point yet, but now I have some idea of how to handle that stage when we get to it! Appreciate your blog! My advice: Listen to your instincts. Don’t fix something that isn’t broken yet. When he gets too big for the crib, or becomes unhappy in it, or when it is just dangerous for him to be in it anymore… that is the time I would consider the big-child bed transition. Good luck! My first daughter was almost 4 when we moved her into her full size bed! She was happy in her crib and I didn’t see any reason to move her! We have our third child on the way and i’m having issues thinking about moving my 2 1/2 year old out of the crib (and it won’t be until she is closer to 3). My advice is to do what is best for you and your family, and don’t worry what others have to say!!! My daughter was very happy in her crib at 3 years of age. At 3 we put our spare bed (which was a double) in her room along with the crib. And over the course of several months we just let her choose what bed she wanted to sleep in. She would always choose the crib. After a while our ped told us to just take the crib down, that she didn’t need it anymore. She actually transition really well. (I like to think because the bed had been in her room for so long.) She just slept on top of the sheets for a long time with her crib pillow and blanket. Around age 4 she finally started sleeping with the big bed bedding. 🙂 She is now 6. My son 26 months is still in his crib and doesn’t show any signs to wanting out. I also have a 5 month old. 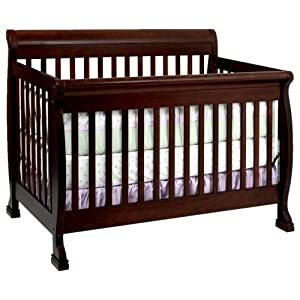 I just borrowed a crib from my in-laws so I could go with two cribs. I was pressured to move my son to a bed but he just didn’t seem ready. I’m so glad we are waiting. Maybe it is like potty training? You can battle it for a long time or you can just wait until they are ready and it will be easy. But hey, this is just my 2 cents. 🙂 Good luck!